During our short trip to New Orleans we enjoyed an incredible morning with the Cajun Encounters team exploring a swamp/bayou as part of a boat tour – and today I’m going to be sharing the experience with you all. 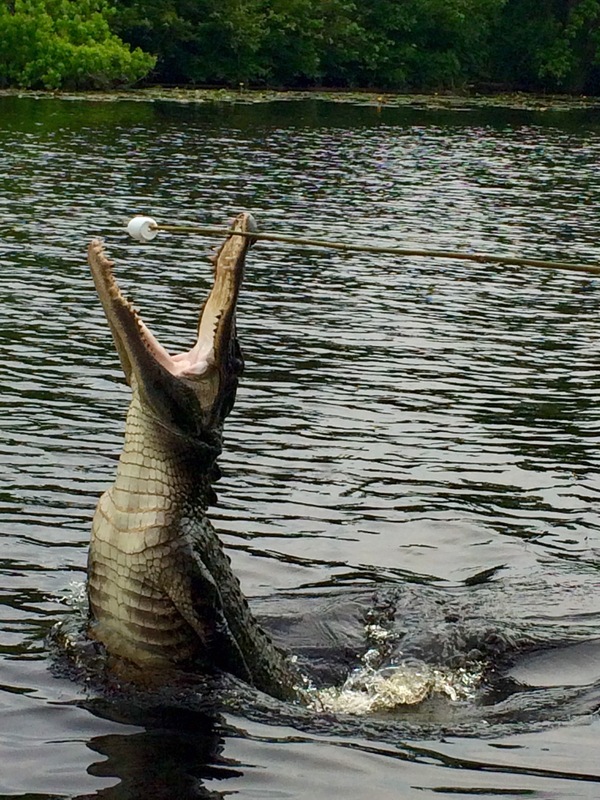 If you’re interested in Gators, Swamp Hogs and Venomous Water snakes… then keep reading. Cajun Encounters launches from a hut right beside Honey Island Swamp, which is around 40 minutes (very scenic) drive from New Orleans. We had expected bad traffic so arrived about an hour early and were invited to sit out on the front deck watching the hummingbirds, local cats and red winged blackbirds with a coffee, enjoying all the sounds that nature could produce. That was the fastest hour of my life, and we immensely enjoyed the wait – Mr K even got to hold a gator, supervised by an expert, of course. 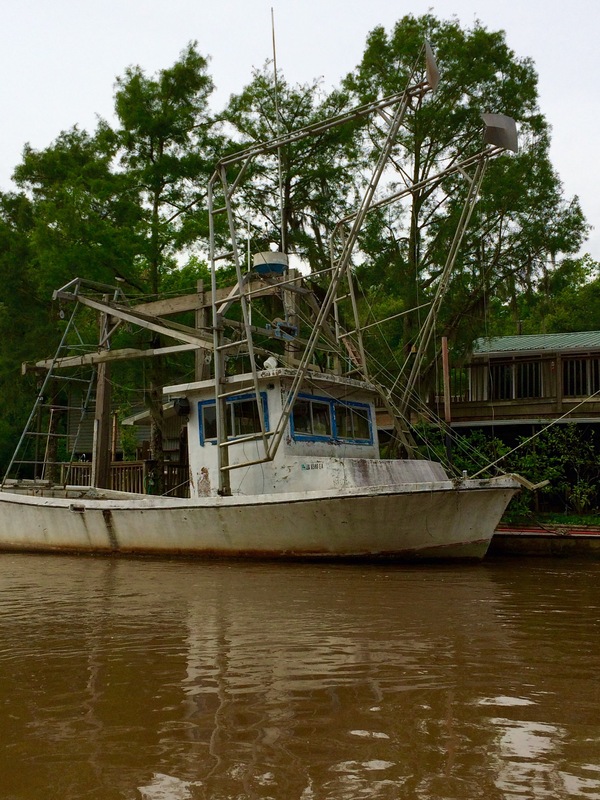 We were then ushered onto our boat with Captain Ryan, who was both comical and knowledgeable – he mentioned he’d lived on bayous his whole life, so we were confident about being in good hands. Within minutes of leaving the bank we were up close with a gator – a small one, we were told, but she still looked huge – and Captain Ryan showed us something I’d never expected to see. They eat Marshmallows! This guy shot out of the water like a cannon, and then I sat back down and enjoyed the view from my seat! We chugged along through the beautiful bayou, admiring the tall, wispy Cypress trees and watching the vivid yellow swamp canaries hop from tree to tree. We learned about the habits of the gators, heard tales of the destruction caused by Hurricane Katrina and even saw a water moccasin (which is probably not good news under most circumstances, but this one was a baby, and also a safe distance away). We passed by a couple of swamp-side houses, and despite it being a totally different world to what I’m used to… I could absolutely up sticks and live here on Honey Island Swamp. 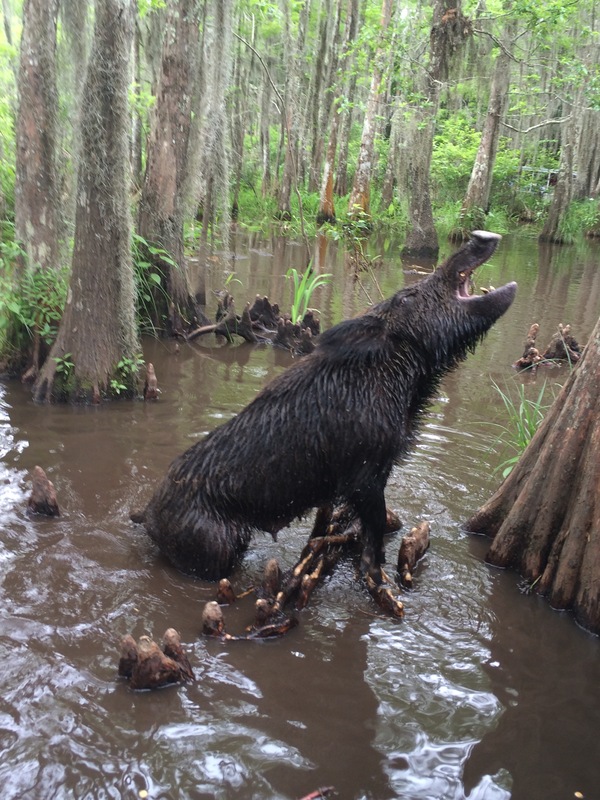 We then headed back upstream to visit the more heavily wooded swamp areas – where we experienced some true swamp beauty, and unexpected residents! 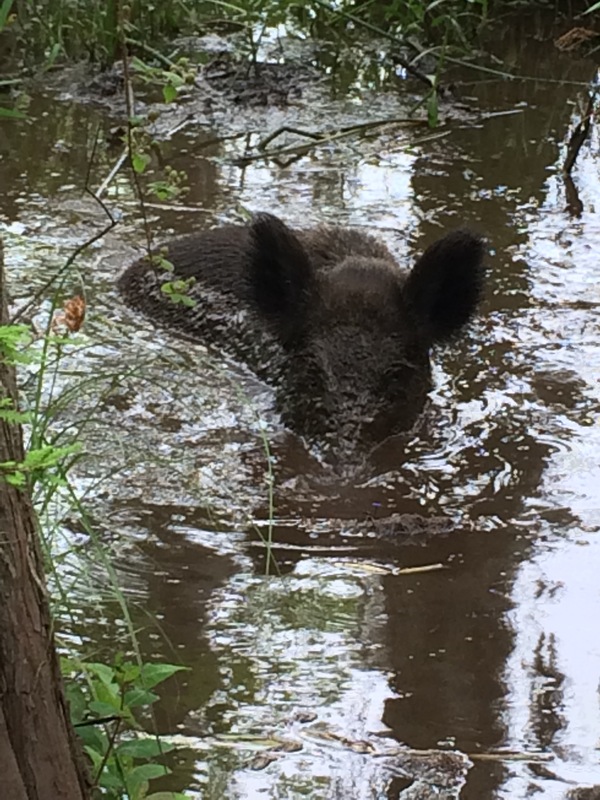 I might have been naive to assume that we would not encounter Swamp Hogs – but we did, and there were a whole bunch of them! They even had babies, and they could all swim. I must say that, despite them stinking, they were absolutely adorable. However, we were warned, they’re not quite as cute as they appear and it’s not beyond them to attack humans or small animals on the outskirts of the swamp. For that reason, we let Captain Ryan take charge of feeding them marshmallows from his mouth – better safe than sorry, and he does this every day! After this we started to head back to dock, learning about the restrictions on logging Cypress (it’s illegal) and how population management of the hogs and gators works (I think you can probably guess). We cruised slowly through foggy wetland, seeing the occasional turtle or baby gator creeping through the covered areas, keeping one cautious eye on us. It was as incredible as it was unnerving. It was absolutely one of the best days of our trip – we learned and saw so much, and despite having done it now, we’d go again at the drop of a hat. The only thing I didn’t enjoy was that there was a really horrid white spider on our boat, which I lost after a few minutes, so I was nervous about it finding its way onto my body. We thought it might be a male brown recluse based on pictures we looked at later, but who knows? Anyway, if you ever find yourself in Louisiana I’d recommend taking this tour above anything else we did! It cost us $22 each and was easily the best $22 we spent that week! I went the same trip with Captain Rayan 2 years back but i missed to see swamp pig. thanks.